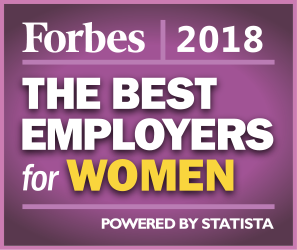 The top 300 "Best Employers for Women" have been chosen based on an independent survey from a vast sample of 40,000 American employees working for firms or institutions with 1,000 or more employees (The sample included more than 25,000 women). The employees were not consulted via their employers but anonymously through several online panels. By doing so, the employee could openly state his/her opinion, avoiding any influence from their employer. The survey was conducted using an online access panel. In an open-ended question with an autofill-option, each employee was asked which firm or institution he or she worked for. Where appropriate, subsidiaries of larger entities were combined for evaluation. The survey was conducted on companies from all industry sectors employing more than 1,000 employees in the United States. The rate of agreement/disagreement regarding the statements was measured on a 5-point Likert scale. Additionally the likelihood of recommending one’s own employer (measured on a 11-point Likert scale) was also asked. The score is based on recommendations from women. In addition a perception correction factor (based on the comparison between recommendations from women and men) was considered: to this end, we took all recommendations made by women and separated them from the recommendations made by men. The difference between men’s and women’s votes (=perception correction factor) was then added to women’s recommendations. Direct recommendations – topics relevant for women in particular: To focus on topics which are in general more relevant for women, women were asked to rate their own employers regarding parental leave, family support, flexibility, discrimination, representation & career, pay equity (5-point Likert scale). The relevance of each topic (as well for the topics in general) was determined by a regression analysis. Indirect recommendations: Additionally, participants were given the chance to evaluate other employers in their respective industries that stand out either positively or negatively with regard to diversity. Only the recommendations of women were considered. Diversity among top executives / board: Based on extensive research, an index was built based on the share of women who fill top executive or board positions. Statista researched this data for each company using publicly available company information. A score was calculated for each criterion and the sum was consolidated into a final score for each employer on a scale from 0 to 100, ranking the employers accordingly. 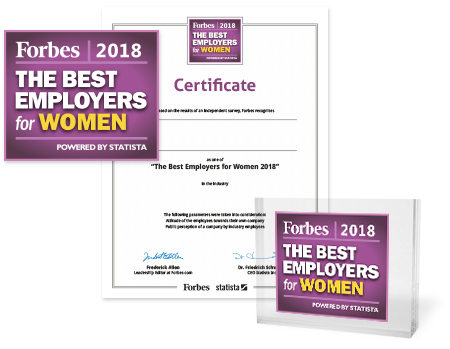 The 300 highest-scoring companies were awarded "The Best Employers for Women"
Use of the label in your promotional materials is only permitted unmodified and only for a period of one year. You may not attribute any statement of fact to Forbes other than your placement on the list in your respective industry. You alone are responsible for the admissibility of the commercial use of the seal under competition law; in this respect, Forbes and Statista give no guarantee and assume no liability. In consideration for payment, you (The Licensee) are hereby granted a nonexclusive, worldwide, non-transferable, non-sub-licensable license during the term of this Agreement for digital use rights (web posting, email, digital presentations, branded social media and similar) and print reproduction use rights (letterhead, sales materials, reports, white papers, brochures, posters and signage and similar) of the Forbes Logo (The Logo) pictured in this agreement. Licensee acknowledges and agrees that The Logo and all right, title and interest therein, is and shall remain the exclusive property of FM. Licensee shall not distort, misrepresent, alter the meaning of or otherwise edit The Logo. FM may terminate this Agreement upon 30 days’ written notice if Licensee materially breaches any of the terms of this Agreement; provided, however, that this Agreement will not terminate if the breaching party has substantially cured the breach to the reasonable satisfaction of FM within 30 days of a notice pursuant to this section. Upon termination or expiration of this Agreement, Licensee’s right to use The Logo shall immediately terminate and all rights granted to Licensee hereunder with respect to The Logo shall automatically revert to FM without further notice. This Agreement contains the full and complete understanding of the parties with respect to the subject matter hereof and supersedes all prior representations and understanding, whether oral or written. This Agreement shall be construed and the rights and obligations of the parties shall be governed by the laws of the State of New York.